HomeBase was not a Linux distribution in the traditional sense but, rather, a custom environment tailored for a user's needs. It combines the best of both worlds: an easy-to-use, intuitive operating environment for those who want to keep it simple; a quick, one-click access to a more sophisticated environment for experienced Linux users. While HomeBase DESKTOP comes with a full package of applications, it's simple to pull apps that you're already working with into the HomeBase environment. Rate this project Marcos Guglielmetti has announced the availability of an updated release of Musix GNU+Linux, a Debian-based distribution featuring a large collection of free audio software: "After three months of testing, the stable release of Musix GNU+Linux live DVD 1.0R6 is out. It's a 100% free operating system for artists focused on music production, graphics design and video editing, based on Debian 'Etch' and KNOPPIX. Some packages were upgraded since Musix live DVD 1.0R4, the knoppix-installer fonts now look good, an old kernel 2.6.16 from Musix 0.99 was added to support old hardware. Also, there are many backports made by the Musix team; we highlight LMMS, Jackd, Mscore, Rosegarden and Ardour. This DVD is used daily in music schools, so we know what teachers and students need." Here is the brief release announcement. Download: Musix1.0R6.iso (2,479MB, MD5). Marcos Guglielmetti has announced the availability of Musix GNU+Linux 3.0.1, an update to the Debian-based distribution designed for musicians: "The development team of Musix GNU+Linux is proud to present stable version 3.0.1. This is a bug-fix release related to installation fail due to missing GRUB package. Also, now the ISO image is 'isohybrid', i.e., it supports booting from USB or DVD media. For this version of the installable live DVD/USB image we added some video editors like Kdenlive 0.9.6, Avidemux and Cinelerra, we also added French and Serbian language support, OpenOffice.org, and solved some minor KDE desktop bugs. Musix 3.0 boots into LXDE by default, but you can choose the tailored KDE and IceWM desktops or the original Fluxbox or Openbox. The os-probe package is installed to detect other systems during hard disk installation. The Linux kernel 3.4.14-gnu-RT23 is compiled from the linux-libre kernel source and 'de-blobed' to be 100% free." Read the release announcement for more details. Download: MUSIX_GNU+Linux_3.0.1_Stable.iso (2,016MB, MD5, pkglist). Marcos Guglielmetti has announced the release of Musix GNU+Linux 3.0, a Debian-based distribution with a collection of software applications designed for musicians: "The development team of Musix GNU+Linux is proud to present version 3.0 stable. We didn't find serious bugs, so we corrected the known ones and we think this is a great release. For this version of the installable live DVD/USB stable we added some video editors like Kdenlive 0.9.6, Avidemux and Cinelerra, added French and Serbian language support, OpenOffice.org, solved some minor KDE desktop bugs. Musix 3.0 boots into LXDE by default, but you can choose the tailored KDE or IceWM desktops or the original Fluxbox and Openbox; os-probe was installed to detect other systems during HD installation. The Linux kernel 3.4.14-gnu-RT23 is 100% free as well as all software in Musix and it operates in real time for audio and music production." Here is the full release announcement with screenshots. Download: MUSIX_GNU+Linux_3.0stable.iso (1,931MB, MD5). Marcos Guglielmetti has announced the availability of the second release candidate for Musix GNU+Linux 3.0, a Debian-based distribution designed for musicians: "The development team of Musix GNU+Linux is proud to present version 3.0 release candidate 2. We didn’t found any serious bugs, so we corrected the known ones and we think this is a great release. If nothing weird happens in the span of about two weeks, this will be Musix 3.0 stable that we were all waiting for. Then we will make some improvements for Musix 3.1 (MusixControl running graphically) but there should be minor differences. The installable live DVD was released to get reports from users but it's 99.9% a final stable release. We installed some video editors such as Kdenlive 0.9.6, Avidemux and Cinelerra, added French and Serbian language support, OpenOffice.org, solved some minor KDE desktop bugs...." Read the rest of the release announcement for more information and screenshots. Download: MUSIX_GNU+Linux_3.0rc2.iso (1,930MB, MD5). After nearly four years without a stable release, Musix GNU+Linux, a Debian-based distribution designed for musicians, has been resurrected. The new release is a candidate for the upcoming version 3.0: "The development team of Musix GNU+Linux is proud to present version 3.0 release candidate 1 after 11 months of work since the last beta version and four years since the last stable version 2.0. RC1 was released to get reports from users but it's almost a final release. We updated more than 300 programs from Debian 'Wheezy', re-installed KDE, Rakarrack, Jamin, Blender and various other programs for artistic creation. MusixControl works only in terminal, but that will be resolved soon. IceWM, KDE and LXDE are tailored to activities (office, audio, MIDI, graphics, etc.) The Linux kernel 3.4.14-gnu-RT23 is 100% free (and so is all software in Musix) and it operates in real time for audio and music applications." Here is the brief release announcement which is also available in Spanish. Download: MUSIX_GNU+Linux_3.0rc1.iso (1,688MB, MD5). Marcos Guglielmetti has announced the release of Musix GNU/Linux 2.0, a 100% libre, Debian-based distribution with a collection of software for audio production, graphics design and video editing: "It is a great pleasure for us to announce the availability of version 2.0 of the MUSIX GNU/Linux free operating system, after a year of hard community work. You can get MUSIX 2.0 in two ways: live DVD (plus hard disk installer) and USB (persistent, minimum 4 GB). Major new features: Linux kernel 2.6.29.4 real-time 'full preempt', ready for low-latency audio operations either live or installed to hard disk; custom KDE as default desktop (you can also run GNOME, IceWM, Fluxbox, LXDE); based on Debian GNU/Linux 5.0 'Lenny'; improved installer and start system; persistent USB edition; extensive and updated set of applications...." Read the rest of the release announcement for more details. Download: Musix-2.0.iso (1,962MB, MD5). Marcos Guglielmetti has announced that the first beta release of Musix GNU/Linux 2.0 is now ready for testing: "We have released a new version of the 100% free operating system for musicians, graphic designers, video makers, artists and all kinds of users. This remastered version aims to provide a testing system based on the stable Debian GNU/Linux 5.0 'Lenny'. Several packages were updated, such as the Linux 'libre' kernels 2.6.27 and 2.6.29, which were revised to improve mount actions. It includes new versions of programs for musicians compiled by Spanish guitarist Carlos Pino - Ardor 2.8, jackd 0.116.1, lmms-vst 0.4.4, lv2core 3.0, Qtractor 0.4.1, Rosegarden 1.7.3... As a new addition, we added GNOME to the supported desktops - KDE, LXDE and IceWM + Rox." Read the complete release announcement for more information. Download the live DVD image from here: Musix-2-0-Beta1_dvd.iso (2,072MB, MD5). Marcos Guglielmetti has announced the availability of the second alpha release of Musix GNU/Linux 2.0, a Debian-based live DVD with a collection of applications for media production: "The Musix GNU/Linux team has released the first Musix 2.0 live DVD which includes a huge list of packages along with several applications for graphic design, audio and music software. English, Spanish, Portuguese and French are fully supported. We have included two new realtime-patched Linux kernels: 2.6.27-free (which replaces the 2.6.26.8-libre2), with new modules and bug fixes, and the 2.6.24.7-rt-libre3 boot option for better hardware compatibility. The 2.6.29.1-libre-rt kernel is included on the DVD but it will work only on installed systems. Desktops: IceWM, LXDE and KDE 3.5.10." Here is the brief release announcement. Download: Musix-2_Alfa2_dvd.iso (1,720MB, MD5). Marcos Guglielmetti has released the first alpha build of Musix 2.0, a Debian-based distribution containing a collection of free multimedia software: "Now you can test the alpha 1 release of Musix GNU/Linux 2.0 based on Debian 'Lenny'. Features: a better installer, boot and compression system than Musix 1.0; updated software packages - Ardour 2.7.1, jackd 0.109.2, Rosegarden 1.7.0, Linux 2.6.26.8 and 2.6.24 (both realtime patched), Audacity 1.3.5, GIMP 2.4.7, Solfege 3.10.3, IceWM 1.2.35, etc. We encourage you to test this alpha release so we can get more feedback from artists worldwide. The Rox-Filer launchers are not yet fully working, so please just use the IceWM menu." The distribution claims to have full support for Spanish and English languages; read the rest of the release announcement for more details and a brief to-do list. Download the live CD image from here: Musix-2-0-1.iso (666MB, MD5). Marcos Guglielmetti has announced a new stable release of Musix GNU+Linux, version 1.0R5, a Debian-based distribution designed primarily for musicians and other creative artists: "The Brazilian music teacher Gilberto Borges tells us that he has finished the last Musix GNU+Linux 1.0 stable version on CD, a 100% free operating system for artists focused on music production, based on Debian GNU/Linux and KNOPPIX. This version of Musix, 1.0R2R5, fully supports Brazilian Portuguese and English languages, and it partially supports Spanish, French, German and Italian. Borges highlights the updated packages: Muse 0.8.1a (light Audio and MIDI sequencer), Muse Score 0.9.2.2 (score editor), Painel Musix 1.7 (control panel), Rosegarden 1.7.0 (MIDI and Audio sequencer and score editor), knx-installer 0.3.19.90 (a bug fix for the ugly fonts)." Read the rest of the release announcement for more details. Download: musixbr1r2_musix1r5.iso (702MB, MD5). Marcos Guglielmetti has announced the release of Musix GNU/Linux 1.0R4, the fourth revision of the Debian-based distribution featuring a large collection of free software for creative artists: "The Musix GNU+Linux 1.0R4 live DVD was produced on the basis of the stable version 1.0R3 CD. Musix 1.0 is based on KNOPPIX and stable Debian but it has the latest versions of many important applications. New and upgraded software on the live DVD: Rakarrack (a great effects processor for guitars), LASH 0.5.4, AZR3 1.0.3 (a high quality Hammond organ emulator, ported from a VSTi), Asma davul drum kit... Many fundamental programs have been updated since Musix 1.0R3: Ardour 2.1 (2.4.1 available as a DEB package), Rosegarden 1.7.0, Jackd 0.109.2, LMMS 0.3.2, QJackCtl 0.3.2, WhySynth 2008-04-12, and more. Dozens of packages were upgraded to the latest Debian Etch versions for security reasons." Read the complete release notes for further details. Download: MusixGNU+Linux1.0R4_DVD_Stable.iso (1,953MB, MD5). After five test versions, Marcos Guglielmetti announced the release of Musix GNU+Linux 1.0r3, a Debian-based distribution containing a comprehensive collection of free software for musicians: "It's a 100% free multimedia operating system intended for music production, graphic design, audio and video edition, and all kind of tasks. It contains an enormous collection of free (as in freedom) programs that can replace Windows or Mac OS X. Musix GNU+Linux 1.0 R3 Stable Live-CD was produced on the basis of the stable version 1.0 R2 and the reports about prior test versions. 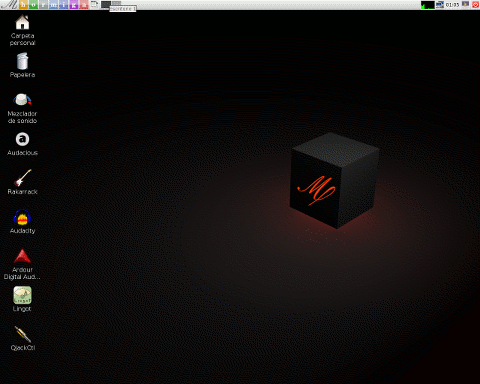 Musix 1.0 is based on KNOPPIX and Debian/Stable. 1.0 R3 Stable solves several 1.0 R2's problems, among them, the "Inconsistent Filesystem Structure" bug after an improper shutdown and the SATA HD installation bug. English is now the default boot language and new functionalities were added, for instance: automount of CDs, DVDs and USB memories, the "install" boot argument, or the "hormiga" add on for KDE." Read the release announcement for additional information. Download (MD5): MusixGNU+Linux1.0r3_Stable.iso (701MB). Marcos Guglielmetti has announced the fifth test release of Musix GNU+Linux 1.0r3, a Debian-based distribution containing a comprehensive collection of free software for musicians: "Musix GNU+Linux 1.0r3 Test 5 live DVD and CD released. This is our first DVD! Musix GNU+Linux 1.0r3 Test 5 live DVD and live CD are both testing versions produced on the basis of the stable version 1.0r2 and the reports about previous tests. 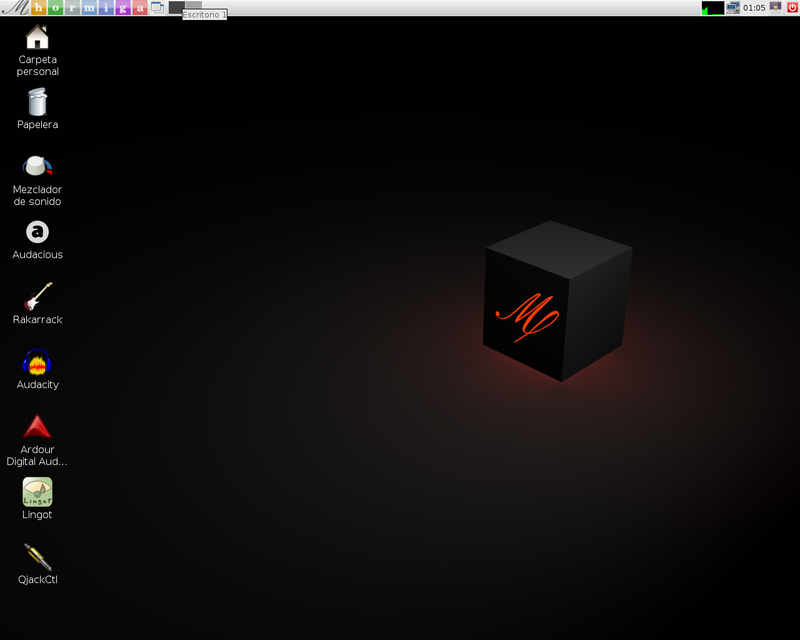 Musix 1.0 is based on KNOPPIX and Debian GNU/Linux 4.0 stable. The goals of the DVD are: better language support; more education, video, graphic, and audio applications; a better general purpose system. New packages on the live DVD: OpenOffice.org (75 languages), full KDE Desktop (63 languages), dozens of educational applications, a 75Mb Steinway Piano Soundfont, full printer and scanner support, Amarok, Scribus, Cinelerra, Kino..." Read the rest of the release announcement for additional information. Download (MD5): MusixGNU+Linux1.0r3_Test5CD.iso (701MB), MusixGNU+Linux1.0r3_Test5DVD.iso (1,878MB). Marcos Guglielmetti has announced the availability of the fourth test release of Musix GNU+Linux 1.0r3, a Debian-based distribution containing a large collection of free multimedia applications: "We released Musix GNU+Linux 1.0R3 Test 4, a testing version produced on the basis of the stable version 1.0R2. This release solves several problems, among them, the 'Inconsistent Filesystem Structure' bug after an improper shut-down and, finally, it solves the SATA hard drive installation bug. English is now the default boot language and new functionality was added, for instance: auto-mount of CDs, DVDs and USB memory devices, or the 'install' boot argument. Fundamental programs have been updated: Ardour 2.1, jackd 0,103, Solfege 3.6.4, MusixControl 1.5. New packages were added: Firefox 2.0.0.3, aMSN 0.97, MusixStarter and Gnumeric." See the release announcement for more details and screenshots. Download the live CD image from here: 6.3-RC2-i386-disc1.iso (700MB, MD5). Marcos Guglielmetti announced the availability of the third test release of Musix GNU+Linux 1.0R3, a Debian-based distribution designed primarily for musicians and other creative artists: "1.0 R3 Test3 solves several Musix 1.0 R2's problems, among them, the "Inconsistent Filesystem Structure" bug after an improper shutdown, and it tries to solve the SATA HD installation bug... Fundamental programs have been updated since Musix 1.0 R2: Ardour 2.1, Jackd 0,103, Solfege 3.6.4, or Musixcontrol. New packages were added: Firefox 2.0.0.3 (iceweasel) aMSN 0.97rc1, Musixstarter or Gnumeric, turning Musix into a friendlier system for general users. Our software repository now contains LMMS 0.3.1, which can handle native VST plugins." Here is the full release announcement with screenshots. Download: MusixGNU+Linux1.0r3_Test3.iso (700MB, MD5). Marcos Guglielmetti has announced the availability of a second test release of Musix GNU+Linux 1.0R3, a Debian-based distribution designed primarily for musicians and other creative artists: "We released the Musix GNU+Linux 1.0R3 Test 2 live CD. Musix 1.0R3 Test2 solves several problems in 1.0R2, among them, the 'Inconsistent Filesystem Structure' bug after an improper shutdown, and it tries to solve the SATA hard disk installation bug. English is now the default boot language and new features were added, for instance: automount of CDs, DVDs and USB storage devices, or the 'install' boot argument. Fundamental programs have been updated: Ardour 2.0.5, Jackd 0,103 and Solfege 3.6.4. New packages were added: Firefox 2.0.0.3 (Iceweasel) aMSN 0.97rc1 and Gnumeric, turning Musix into a friendlier system for general use." Here is the full release announcement with screenshots. Download: MusixGNU+Linux1.0r3_Test2.iso (702MB). Marcos Guglielmetti has announced the first test release of Musix 1.0r3, a Debian-based distribution with a large collection of audio software: "The Musix project has released Musix GNU+Linux 1.0 R3 test1. This testing version was produced on the basis of the stable version 1.0R2, based on KNOPPIX and Debian stable. Musix 1.0R3 Test1 solves several problems, among them, the inconsistent file system structure bug after an improper shutdown. New functionality was added, for instance: automount of CDs, DVDs and USB devices, or the 'install' boot argument. Video editing and graphic design applications have been moved to the live DVD edition that will be out in a few weeks. Many programs have been updated: Ardour 2.0.5, Jackd 0.103 and Solfege 3.6.4. New packages were added: Firefox 2.0.0.3 (IceWeasel), aMSN 0.97rc1 and Gnumeric, turning Musix into a friendlier system for general users." See the full release announcement for more details and screenshots. Download: MusixGNU+Linux1.0r3_Test1.iso (694MB, MD5). Marcos Guglielmetti has announced the release of Musix 1.0: "After two years of hard work, the Musix project team is proud to announce the release of the first stable version of Musix. Musix is a 100% free multimedia operating system derived from KNOPPIX and Debian stable, designed for artists as well as general users. This new release includes the Linux Kernel 2.6.21. The documentation was updated and many important applications were upgraded (among those: Ardour 2.0.0.2, Rosegarden 1.5.1 and the Musix's Control Panel). Some new programs were also installed (MScore, Nekobee). Many bugs were corrected and some new functionality added." Visit the project's download page to read the full release announcement. Get the CD image from here: MusixGNU+Linux1.0r1_Stable.iso (701MB, MD5). Marcos Guglielmetti has announced the first release candidate of Musix GNU+Linux 1.0: "The Musix project has just released Musix GNU+Linux 1.0rc1, a new version of the 100% Free Software multimedia operating system for artists and general users. It is focused on audio and music, but it also contains high quality software for graphic design, 3D animation, video editing and much more. We have corrected many bugs, updated 190 software packages from Debian stable, installed a Linux kernel 2.6.21-rc7, improved the Control Panel, created new boot options, improved support for graphical acceleration and sound cards auto-detection, the graphical aspect and functionality, the menus of KDE and Fluxbox, and much more." Find full details in the release announcement. Download: MusixGNU+Linux1.0rc1.iso (700MB, MD5). Marcos Guglielmetti has announced the release of Musix GNU+Linux 0.99: "The Musix Project is proud to announce the release of Musix GNU+Linux 0.99, a new version of the 100% Free Software multimedia operating system for artists and general users. This is the most stable and user-friendly version until now. Since version 0.79, Musix GNU+Linux is focused on multimedia content creation and especially on music, that is: music production, audio and video editing, 3D animation, graphic design, image editing and web design. Hundreds of software packages have been updated to the Debian Etch versions. New additions include the midi sequencer Muse and the sequencer and synthesizer SpiralSynthModular." Read the comprehensive release announcement for more information. Download (MD5): MusixGNU+Linux0.99.iso (701MB). A new, experimental release of Musix GNU/Linux is now available for download and testing: "The Musix project is pleased to announce the new version of this 100% freedom software operating system for artists and general purpose users. More than 650 packages were upgraded and many others were included, for instance the udev system, the awesome multimedia player amaroK, writing support for NTFS partitions, Samba and mp3 codec for Audacity. The system's start-up process now is totally graphical and the (IceWM + ROX-Filer) Desktop now starts without user interaction." More information and a detailed changelog can be found on the project's download page. Get the new CD image from here: MusixGNU-Linux0.59.iso (695MB); also available via BitTorrent. An experimental version of Musix GNU/Linux has been released for public testing: "The Musix project has released Musix 0.49, along with 459 updated software packages, a new Linux kernel version 2.6.16, and the KANOTIX installer. Musix 0.49 is an experimental version that was made to support new hardware, for example the SATA hard disks, and new sound and video cards. The most relevant upgraded packages into Musix 0.49: AbiWord 2.4.4 (word processor based on GTK+), Beast 0.6.6 (music synthesis and composition framework), Denemo 0.7.5 (a GTK+ frontend to GNU LilyPond); jackd 0.101.1 (JACK Audio Connection Kit...." Find more details in the release announcement. Download: MusixGNU+Linux-0.49.iso (688MB); also available via BitTorrent. A new version of Musix GNU/Linux, a Debian-based live CD with a large collection of audio software, has been released: "Thanks to the support of the Ututo Project, FSF, Ourproject, and to the usual collaborators, the Musix project has just released Musix 0.40. Musix 0.40 can be considered the most stable and functional Musix version until now, and its use is recommended in the long term." Musix 0.40 includes a number of new audio programs, such as Rosegarden 1.2.3, Mixxx 1.4.2 (Digital Disc Jockey Interface), Cecilia 2.0.5, Csound and others, as well as many updated packages. For more details and known issues please consult the release announcement. Download: MusixGNU+Linux-0.40.iso (694MB); also available via BitTorrent. As the name suggests, Musix is a Linux live CD containing a large collection of audio software and designed for musicians. Version 0.39 was released earlier this week with the following changes and updates: "Rosegarden4 1.2.3 (Musix is the first distribution with this version); X.Org 6.9.0; four kernels; some general graphics design changes; KDE 3.5.1; all source code available from www.gnu.org; eq-xmms-musix modified by Pardo (recommended); hundreds of software packages updated; lots of fixed bugs, and more." More details can be found in the release announcement and release notes. Download from here: musix-0.39.iso (684MB). A new version of Musix GNU+Linux, a KNOPPIX-based live CD with a selection of specialist software for musicians, has been released: "The Musix GNU+Linux development team is proud to present a new improved version of the 100% free operating system for musicians." The release announcement, available in Spanish and English, includes some details about improvements in this release, such as substantial performance optimisation, addition of Timidity with Freepats and Hydrogen drum machine, synchronisation with Debian 'etch', and other new features. See also this discussion (in Spanish) at Barrapunto. The new Musix 0.26 ISO image can be downloaded from here: MusixGNU+Linux026.iso (700MB).